On May 18, 1980, Mount St Helens blew in the US state of Washington. The eruption, which measured 5 on the Volcanic Explosively Index, has been declared as the most disastrous volcanic eruption in modern US history. A huge column rose 80,000 feet into the atmosphere and deposited ash in 11 states, killing at least 57 people and causing more than $1billion (£770million) in damage. Now scientists fear it could happen again. Dr Donald Swanson, who works for the United States Geological Survey (USGS), witnessed the aftermath of the last explosion. He described the apocalyptic scenes he witnessed two days after the main event on Amazon Prime’s “Mega Disasters” documentary. He said in 2006: “It was like walking on the moon – I have never seen anything like it. “This entire area of 230 square miles was totally devastated, there was not a living thing in that entire area. “Not an insect or a bird or an animal. 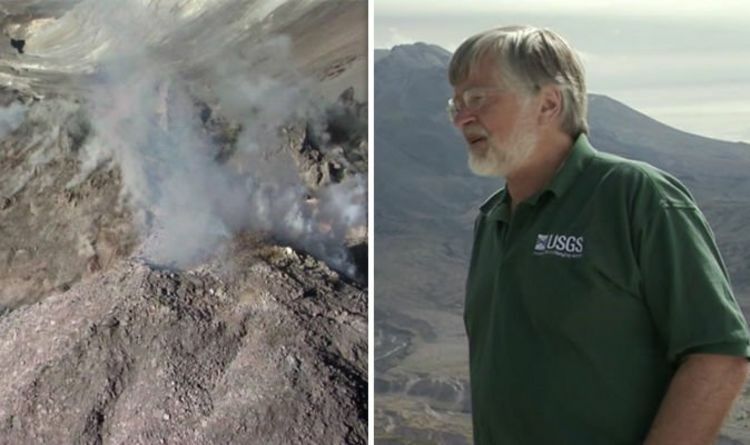 Dr Swanson is now working alongside colleagues at USGS to monitor the activity of St Helens. The documentary went on to reveal how scientists are using an apparatus known as a “Spider” to keep an eye on volcanic activity. Rick LaHusen is the man in charge of monitoring any changes in activity through this technology. He explained: “It’s a stainless steel superstructure that looks like a daddy-long-legs. “What is really phenomenal is how much rock is still coming out of the ground.